Jessica Van Ranken, junior in political science, was elected 2016-2017 KSU student body president. Trenton Kennedy, junior in entrepreneurship, was elected as the study body vice president. 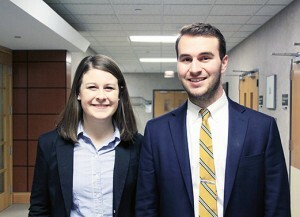 Van Ranken and Kennedy took office on April 7, and began advocating for the three initiatives of their campaign: mental wellness, diversity and political advocacy. For the mental wellness platform, the student leaders seek to strengthen the relationship between the university’s Counseling Services and Student Governing Association to de-stigmatize mental illness on campus and promote the programs of Counseling Services. For diversity, Van Ranken and Kennedy want to work with university administration to provide cultural competency training for faculty and students. Also, they want to lead the Student Governing Association in fundraising for a multicultural student center. For the pair’s third campaign tenet — political advocacy — Van Ranken and Kennedy would like to create a nonpartisan advocacy organization, which they are calling Kansas Student Voice. It would partner with other colleges and universities to promote voter education and registration, as well as prioritization of higher education funding. We are extremely pleased to see one of our majors representing students in an important leadership position and engaged in promoting political advocacy and engagement. Congratulations, Jessica! We look forward to seeing the work you accomplish as student body president!